New data from the UK provides a stark contrast between onshore and offshore enrolment trends, and indicates a growing emphasis on transnational education (TNE) among Britain’s higher education institutions. The Higher Education Statistics Agency (HESA) reports that international enrolment in the UK was essentially flat between 2013/14 and 2014/15. Enrolment from other European Union countries fell slightly year-over-year while non-EU student numbers were up marginally (.7%). Overall, foreign enrolment in British higher education was virtually unchanged over the two years, from a total of 435,495 in 2013/14 to 436,880 in 2014/15 (a .3% increase). With the exception of the US (up by 1% year-over-year), all top ten non-EU markets for British higher education fell off last year. Reflecting a pattern of the previous couple of years, Indian enrolment continues to erode most notably with a 10% decline between 2013/14 and 2014/15. This marks the third consecutive year of soft growth or no growth in international enrolment in the UK. The pattern stands in sharp contrast to other major destinations – such as the US, Canada, Australia, China, and Germany – that have all recorded significant enrolment gains over the same period. This declining performance is partly a function of shifting patterns of demand, and relative currency values in particular, in a number of established and emerging sending markets around the world. But it also has a lot to do with the UK’s more restrictive visa policies for international students in recent years. Perhaps it is not surprising then that British providers are shifting more of their focus to offshore delivery. A newly released study from HEGlobal, a joint initiative between the UK HE International Unit and the British Council, finds that the number of international students enrolled in British TNE programmes increased by 13% between 2013/14 and 2014/15. Moreover, four in five higher education institutions in the UK plan to further expand their TNE provision over the next three years. The Scale and Scope of UK Higher Education Transnational Education draws on HESA data as well as a further detailed survey of all UK higher education providers delivering TNE programmes in 2014/15. The HEGlobal study reframes this broad definition into three distinct categories of TNE: local delivery partnership, physical presence (referring mainly to international branch campuses, or IBCs), and distance or online provision. The following chart shows the breakdown of British TNE enrolment in the top five offshore markets across these three categories for 2014/15. All told, the study finds a total of 665,995 students enrolled in British TNE programmes in 2014/15. While a majority of UK higher education institutions are involved in TNE delivery, this enrolment is notably concentrated by provider with 75% of all students accounted for by roughly 14% of UK institutions involved in TNE provision. This value is further skewed somewhat by the large global footprint of Oxford Brookes University, which alone accounted for more than 40% of all TNE students in 2014/15. Nearly all Oxford Brookes offshore students are enrolled in a BSc (Hons) Degree in Applied Accounting jointly developed with the Association of Chartered Certified Accountants (ACCA). Students enrolled with ACCA and studying towards its qualification are also automatically enrolled in the Oxford Brookes degree programme. Even so, enrolment growth outside of the Oxford Brookes stream has been strong (13% year-over-year), and there were 22 other UK institutions in 2014/15 that each had more than 5,000 active TNE students last year. 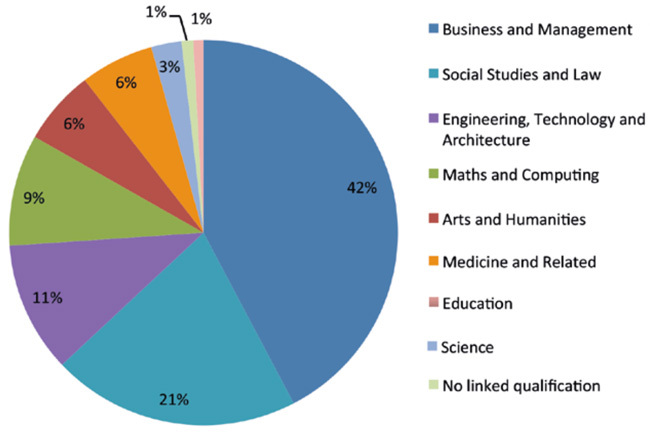 As the following chart reflects, Business and Management programmes account for about two of every five TNE students enrolled with British providers, followed by Social Studies and Law, and then STEM subjects. Programming is roughly split between undergraduate (47%) and post-graduate studies (44%). 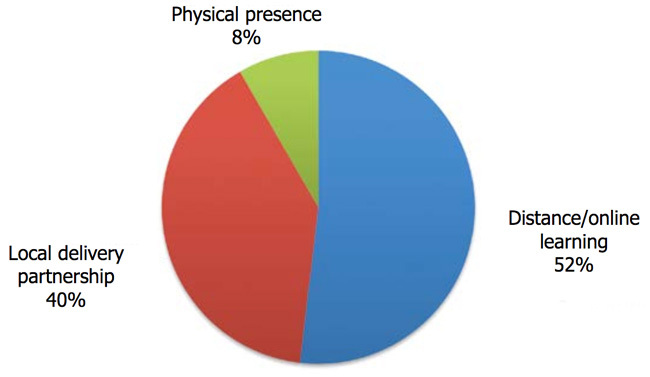 The study finds as well that most TNE students of British institutions are based in Asia (28%). Another quarter (23%) are in the European Union, 14% in Africa, and 13% in the Middle East. However, the table of leading markets for British TNE has shifted somewhat. 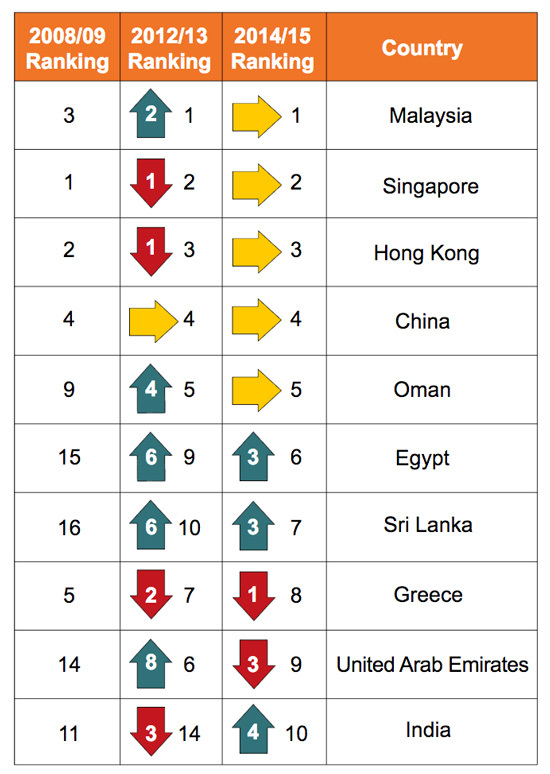 The lead markets remain unchanged but notable changes are afoot outside of the top five, where Egypt, Sri Lanka, and India have seen a marked increase in TNE activity over the last two years. In this respect, the British approach to expanding TNE delivery in collaboration with local partners appears to echo a similar approach envisioned in the recently releases national strategy for international education in Australia. The efforts of providers to adopt more flexible, collaborative modes of delivery for education abroad mark a new and important phase of development for international education, one that might expect to see more widely reflected by other traditional destination markets in the years to come. This entry was posted in Europe, Higher Education, Regions, United Kingdom and tagged online teaching and learning, student enrolment, transnational education, Higher Education Statistics Agency, international students. Pingback: Gezi.biz | Hotel Booking, Rent A Car, Flights, Guides, Travel » What are some excellent topics to get a US history essay?